I’m going to run a MARATHON!!!!! 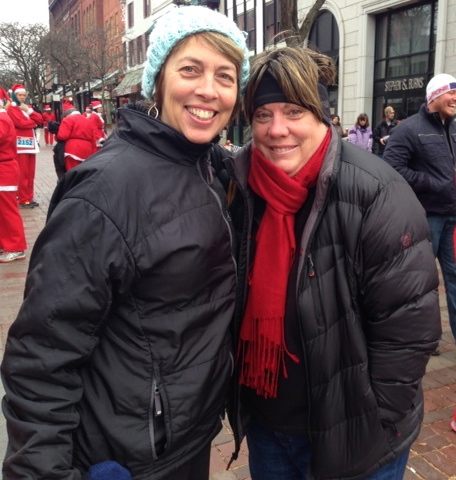 My sister registered me for the Maine Coast Marathon as one of my Christmas presents. Thank you so much, Justine! May 11th, here I come! Officially 19.5 weeks away. Slightly scary, but mostly exciting. The race starts at Kennebunk High school and finishes at the Harold Alfond Forum at UNE in Biddeford. The course is a USATF-certified course and can therefore be used as a Boston Qualifier. The race website makes it very clear that the course is NOT flat. I’m guessing that there are some people who assume that it is because the race is on the coast. However, the finishing times do say that it is fast. Below is a course elevation map. From a glance, I can tell that I’ll have to be very careful the first 6-ish miles because it’s all slightly downhill. Also, the last 5-ish miles are slightly uphill, so I’ll have to be conservative as to not die at the end. Overall, the course is not hilly, but it is not flat either. 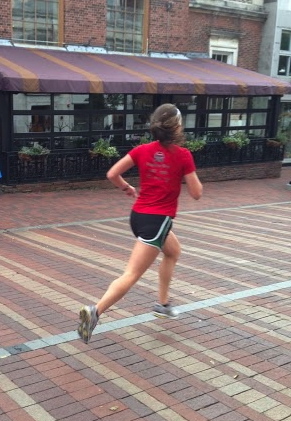 Since I run in Vermont, I feel kind of silly not calling it flat, but I know better from my past half marathons. What looks like an insignificant “bump” can be excruciating depending on where it is on the course. I can only imagine how that translates to a full marathon. There is a limit of only 750 runners, as they wanted the marathon “to exceed your expectations in terms of quality.” Over the 26.2-mile course, there are 15 aid stations. All have water and Gatorade, while 7 of them will have real food. They haven’t specified yet what the food is, but last year there were oreos and watermelon. Strollers and dogs are not allowed, while mp3’s are discouraged. Most importantly, everyone will receive finishers’ medals and a long sleeve tech shirt. All in all, I think it will be a very good race for my first marathon. It’s not too hilly, not crowded, and sounds like a very beautiful course. I’m so excited!!!! 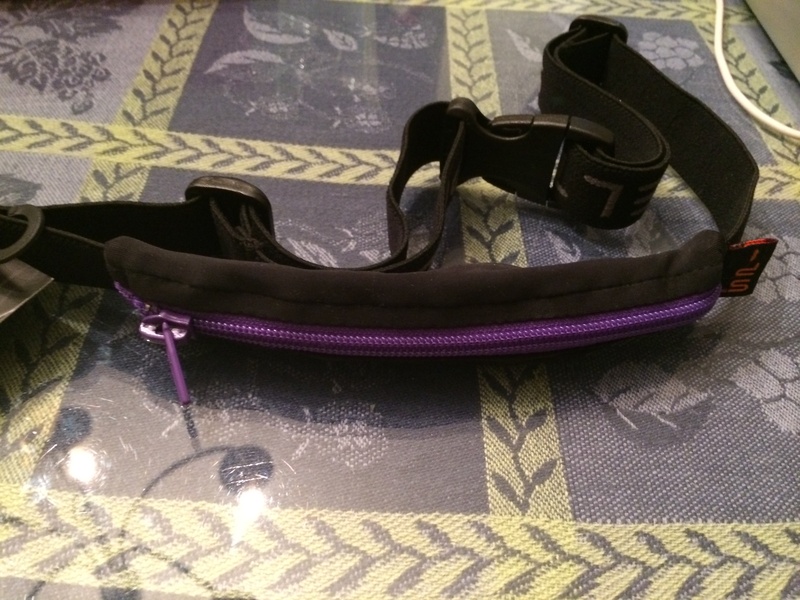 SPIbelt – my parents got me this lightweight belt that I can wear on my runs. It easily zips in any essentials like a phone or some cash that I might want to bring with me. I don’t normally bring much with me on my runs besides my room key and school ID when I’m at school. However, on longer runs, I like to bring my phone or a power bar. 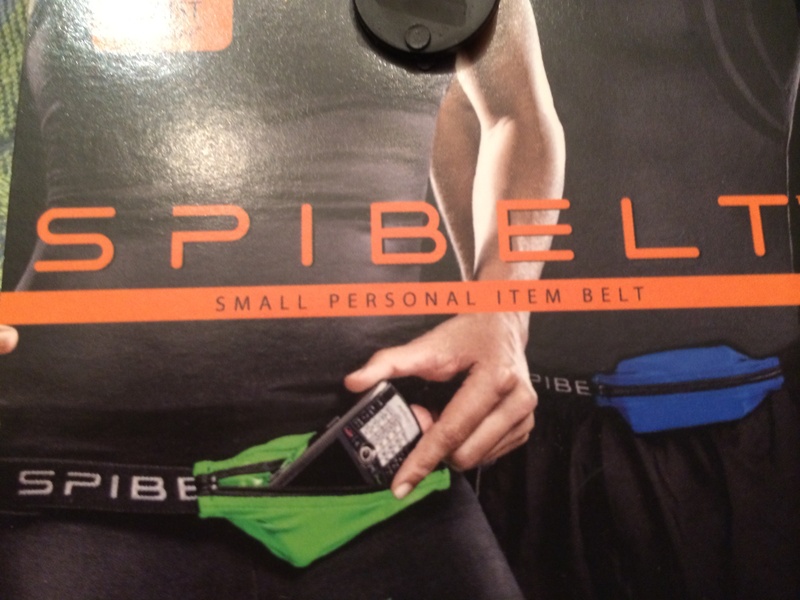 I joke that the SPIbelt is a “cool fanny pack” as it is much smaller than most packs and can easily be hidden as most shirts cover it. I originally bought my mom one for Mother’s Day, but I keep borrowing hers. Sorry! I think she finally decided that I needed my own. 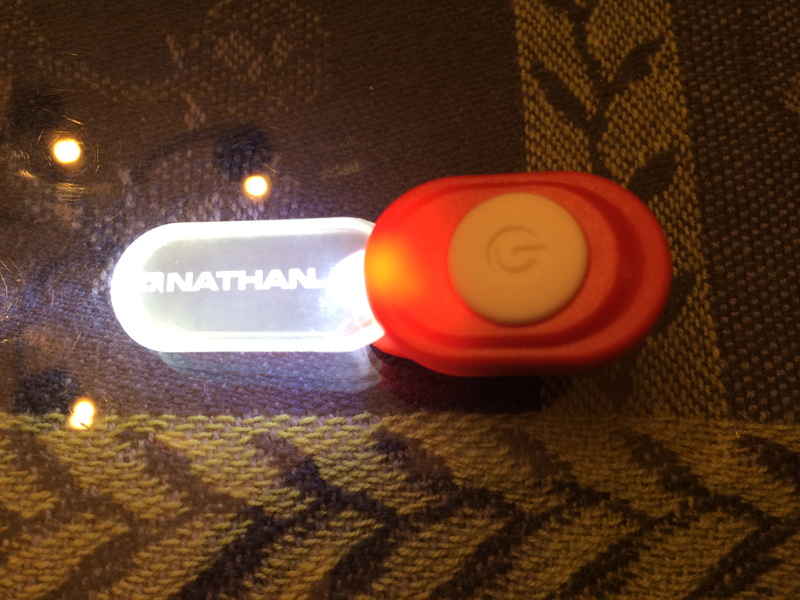 ClipLight – my parents also got me this little clip-on light that I can attach to my shirt or something when I’m out on my runs. I’m not a huge fan of running when it’s dark, but sometimes I do find myself out there as the sun is setting. The light can blink or just stay on. I just have to remember not to leave it on my clothes so that it won’t go in my laundry! 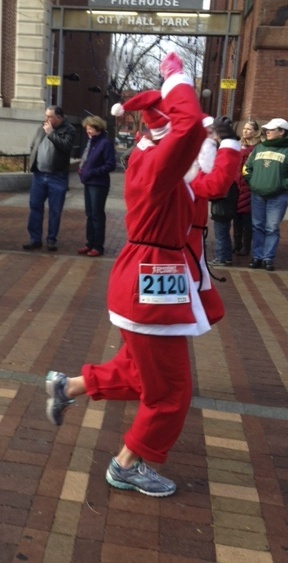 Did you get any running-themed presents for the holidays? What’s your favorite? I hope everyone is having a great holiday – whatever you may be celebrating. I’m enjoying spending time with my wonderful family. I love when everyone is home. 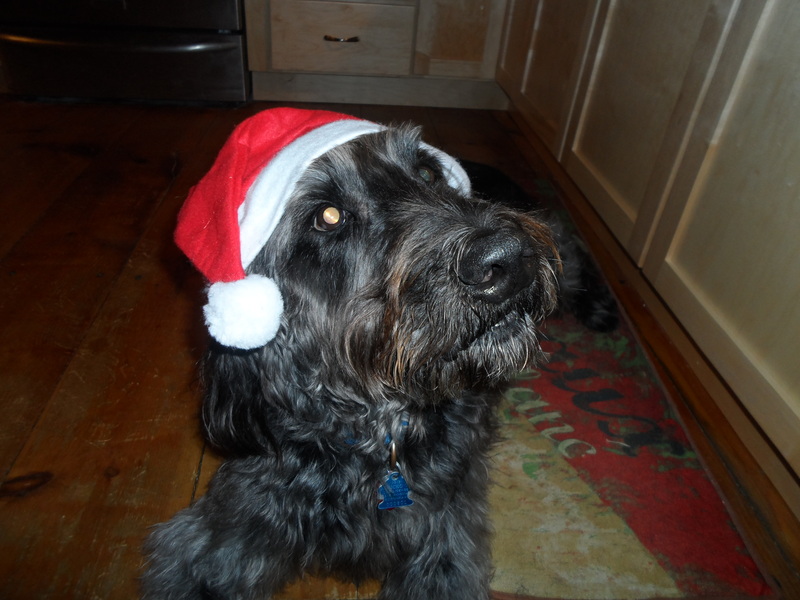 Rudy (my sister and brother-in-law’s dog) says Happy Holidays as well! An added bonus to this year’s Christmas is that we have power! Two hours after my last post it went out for 40+ hours. I feel like I kind of brought that on by writing about the ice storm. Anyways, it just came back a few hours ago. Yippeeeee!!!!! It’s time for our close-ups! 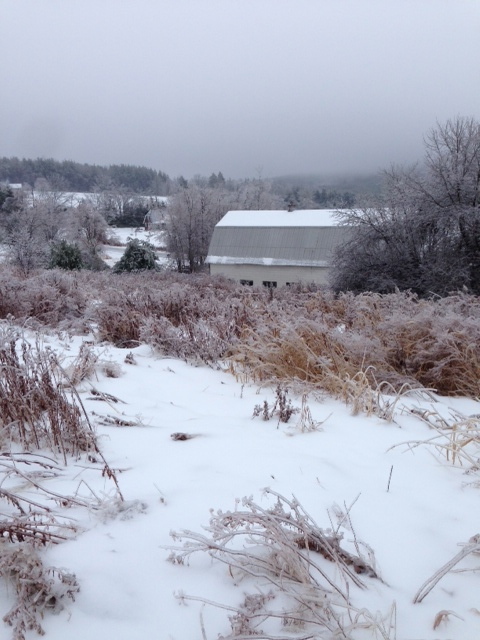 What was looking like the perfect Christmas in Vermont took a nasty turn for the worse this weekend. 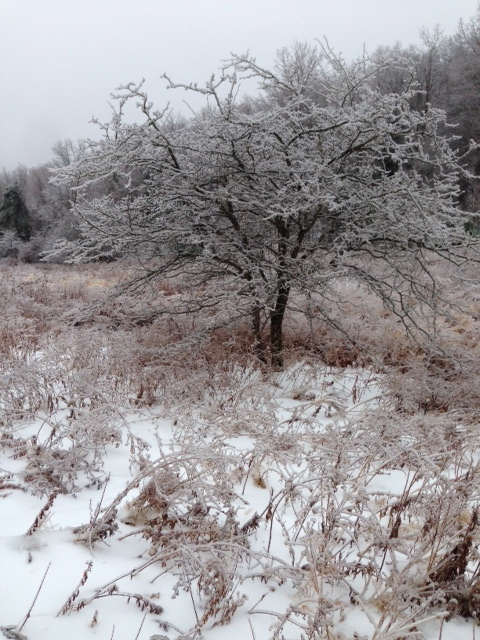 The temperature rose and all the nice fluffy snow started to melt. 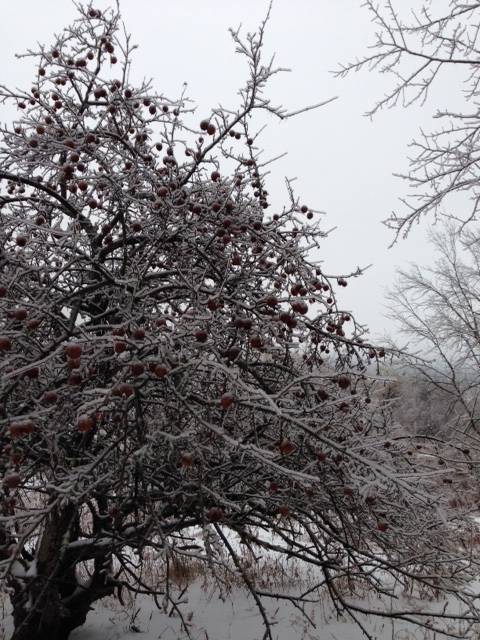 Since Friday we’ve been getting freezing rain… just perfect. My driveway is officially a bumpy ice skating rink. 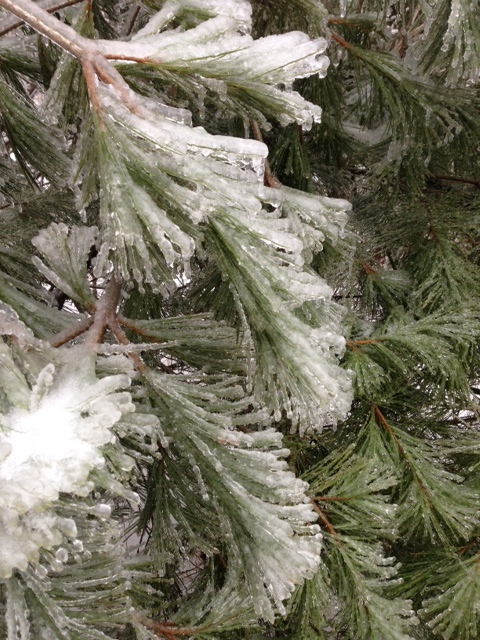 I wrote a winter running guide, but how do you run outside when everything has a ½ inch sheet of ice covering it? There are plenty of ways to make your running shoes more suitable for icy conditions – Yaktrax, Microspikes, and Bugrip to name a few. Some people will even drill screws into the bottom of their shoes. 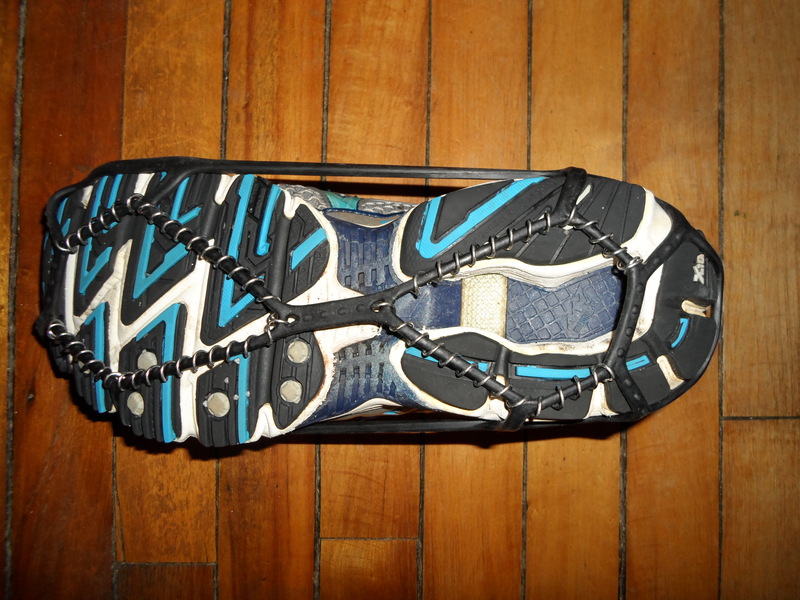 I’ve got a pair of Yaktrax that I use in icy conditions. It’s a rubber device that stretches around the bottom of your shoe with steel coils and provides a much better grip than normal shoes do. It comes in plenty of different sizes to fit everyone. I started out pretty cautious, but soon realized the Yaktrax were doing a fine job and could run at my normal pace. The ones I have mainly have the metal bits towards the middle of the shoe. Since I’m mostly a heel striker I tried to land more on my midfoot (especially on the downhills) to try and get the best traction possible. This made me feel a little awkward, though. It could have been fine without me doing this, but I wasn’t going to take a chance! To anyone that saw me running the past few days, I don’t always look so strange! 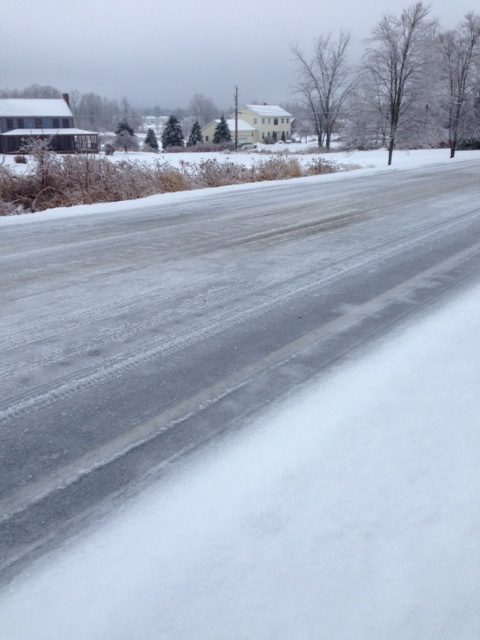 The roads were pretty deserted today, as winter travel was highly discouraged due to the weather. This made it possible for me to run more in the middle of the road where there was less ice. The shoulders, at times, were pretty coated. When doing this you have to be very cautious and aware of any oncoming traffic. If there is a blind corner or blind hill coming up then you should be on the shoulder. Plus, if it’s windy out this can make it hard to hear any oncoming traffic. I felt comfortable doing this today since there were hardly any cars and it was not particularly windy. This might not apply to many people, but my town has plenty of dirt roads that are great for running. There is less pounding and less traffic, which makes it a runner’s paradise. However, this is not so true in the winter. 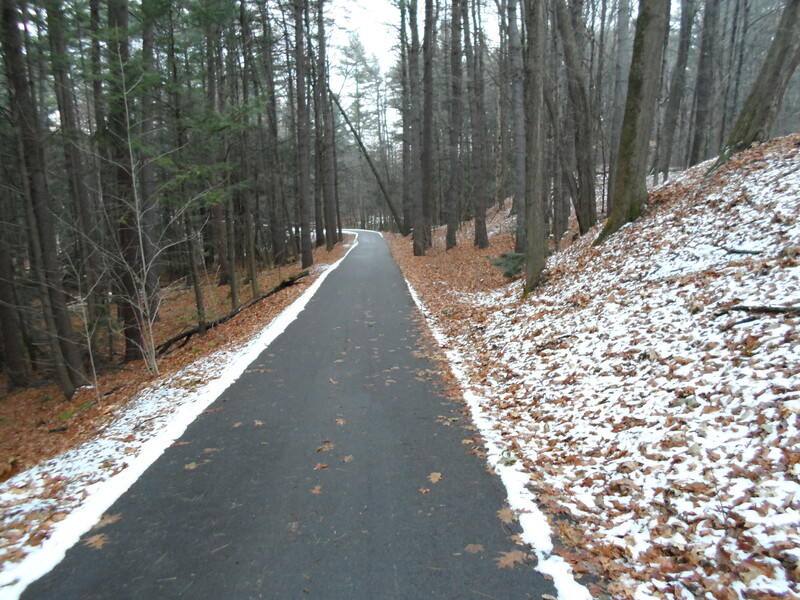 Any snow that comes down packs onto the dirt more easily than it does to pavement. The layers keep building up and building up until it gets pretty icy. Add some freezing rain and you’ve got a disaster waiting to happen. My shoes and clothes were thoroughly soaked after my run yesterday. 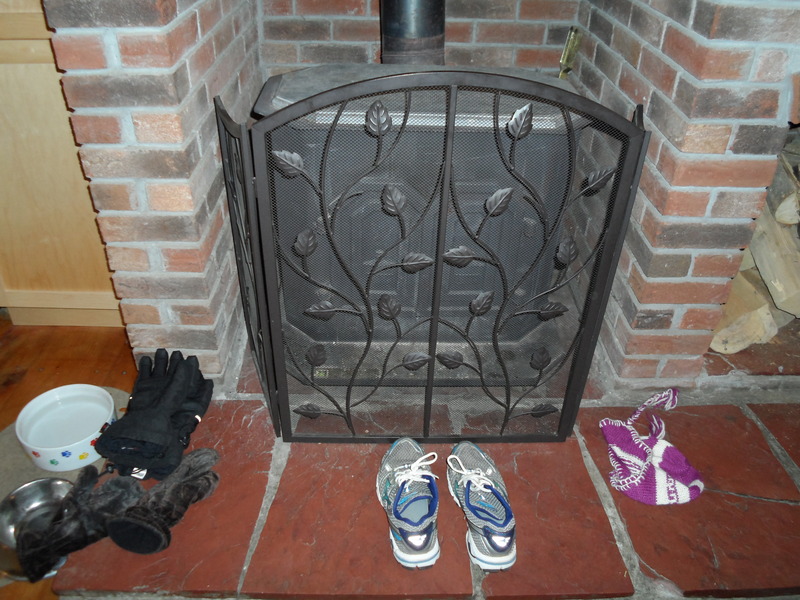 Luckily, I have a wood stove to dry them out and make them nice and toasty for my run the next day. A heater will work fine as well, though. Here are some photos from the trails in back of my house. Photo credits to my mom! Does anyone else run when it’s icy out? What are your tricks for dealing with it? Samson on our camping trip last summer. 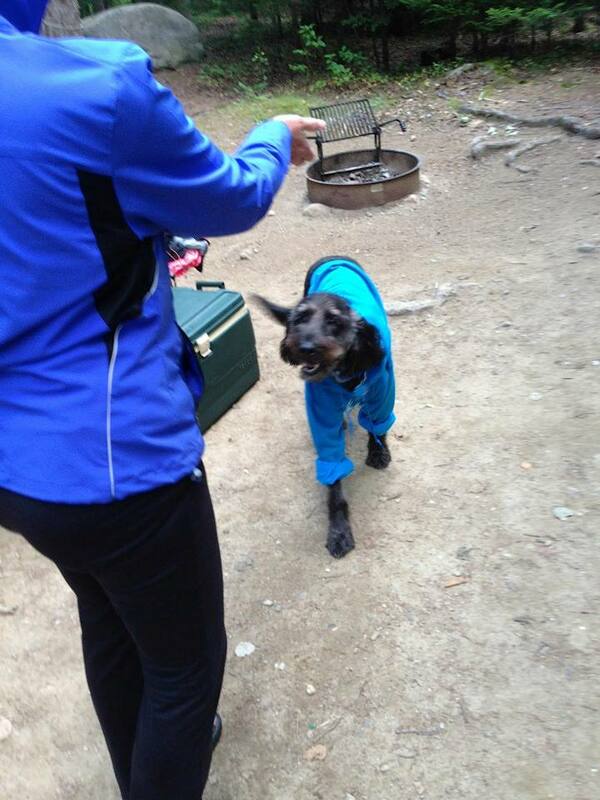 It got so cold during the night that we got him a hoodie to help him stay warm. 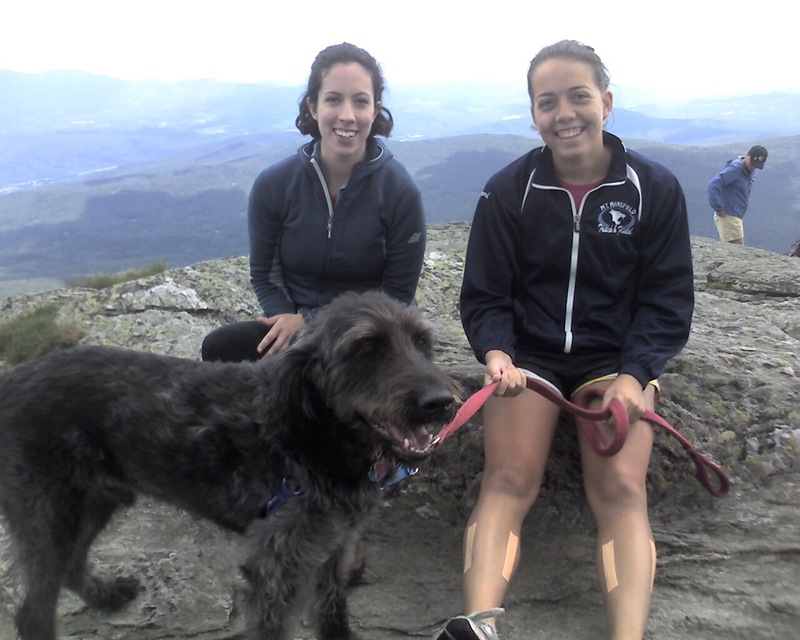 Since the title of my blog is “Joy Runner” I thought it be fitting to write about my dog, Samson. If I had to pick any adjective to describe him, it would probably be joyful. 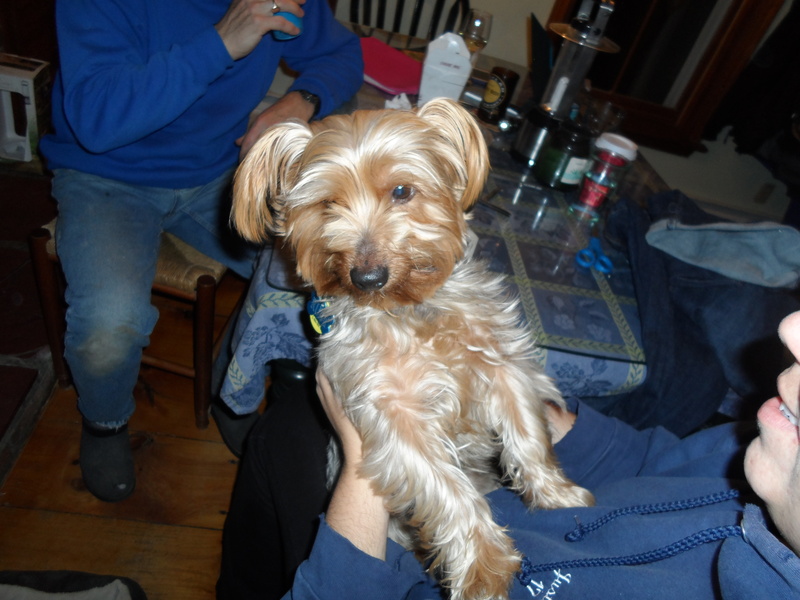 He’s always happy, always wagging his tail, and just loves to be around people. Samson is a great dog to run with. He has a lot of energy, so it’s good when it gets channeled into some exercise. 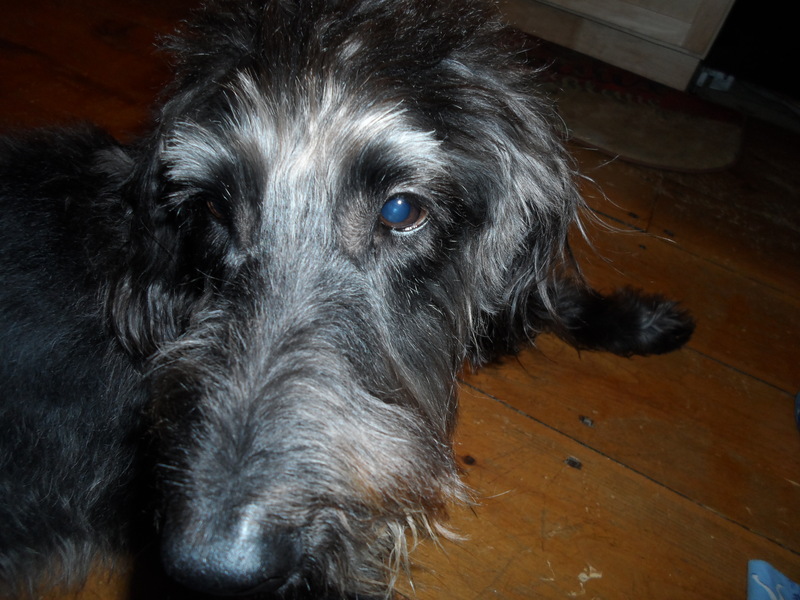 He’s a labradoodle – or at least that’s what we think he is. Both Labrador retrievers and standard poodles are good for running with, so it only makes sense that Sam is also a good running buddy. 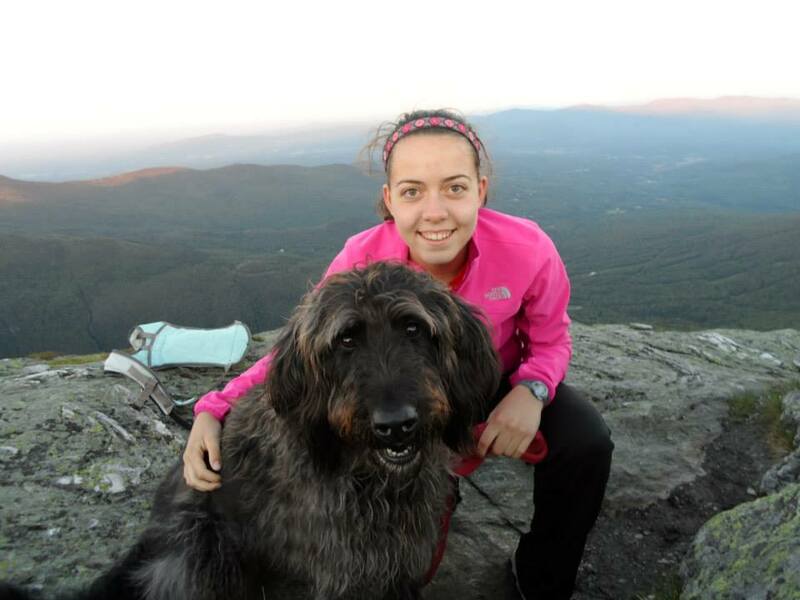 Here’s a link that tells you what type of a running partner your dog is! Obviously all dogs are different and there are some types that are better at running than others. We adopted Samson about four years ago from Golden Huggs Rescue. 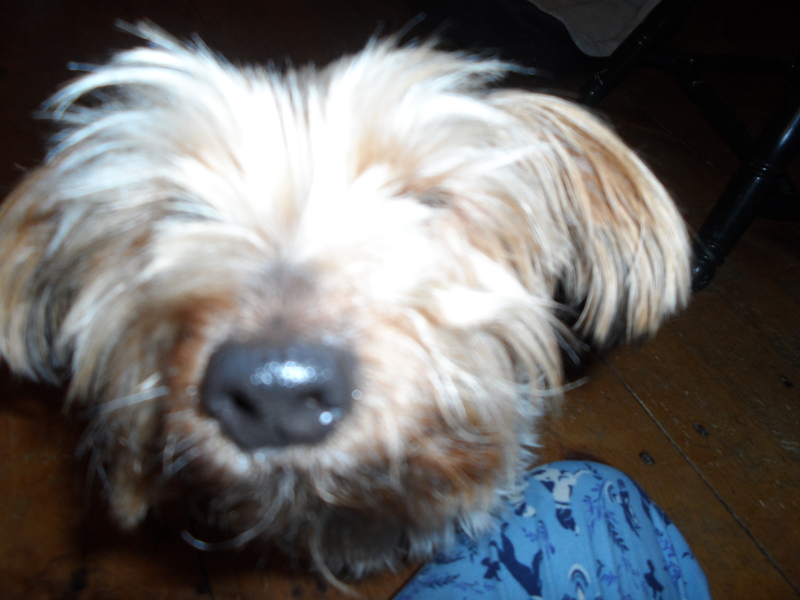 He had been found in Tennessee after his previous owner had fallen into financial difficulty. Sam had been left in a chain-linked enclosure with no food or water for three days. He was down to a mere 44 pounds. To give you some perspective he now weighs a healthy 70 pounds. Luckily, the rescue helped him get back to good health. 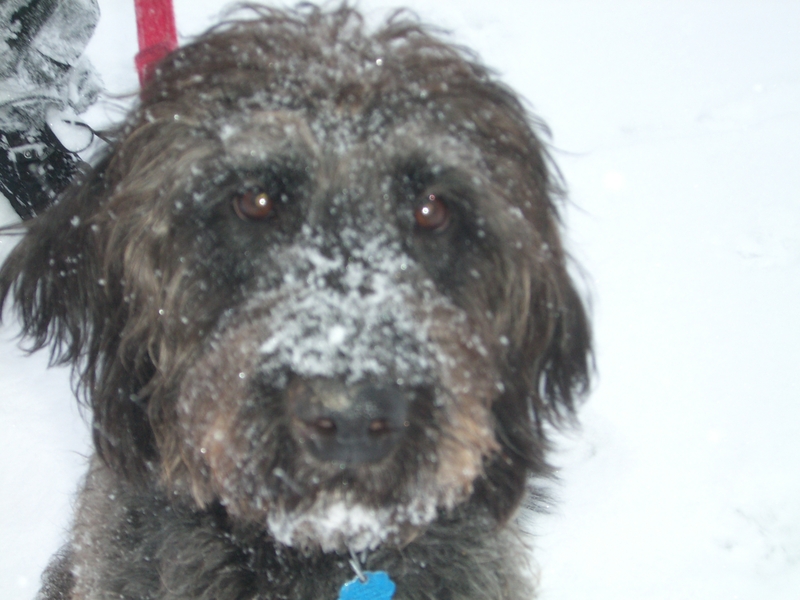 In the meantime, my mom found a picture of Samson online. We immediately fell in love with him and soon after went through the adoption process. 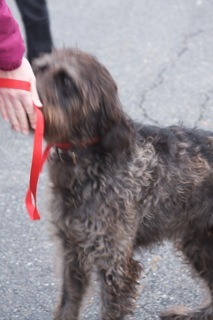 When he was better, they brought Samson up north in a big trailer along with other dogs being transported to their new families. 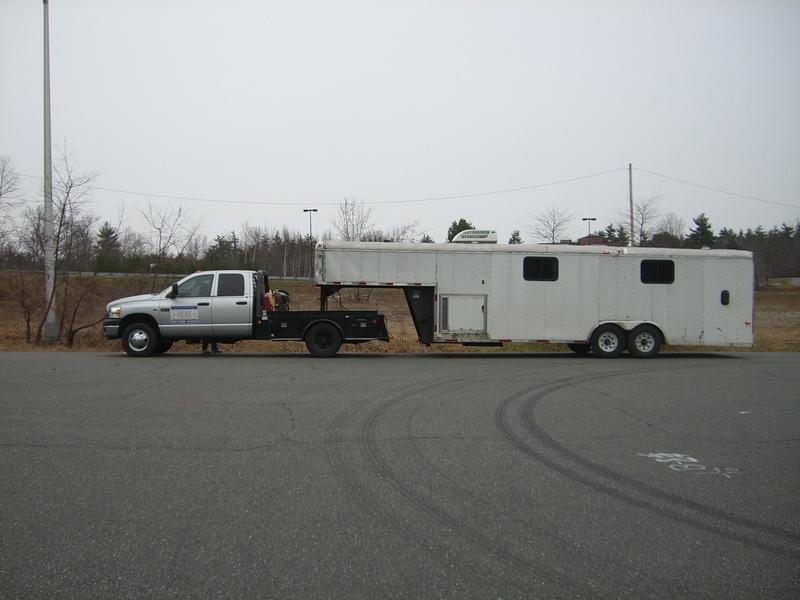 We were so excited when the trailer arrived! meeting him for the first time! 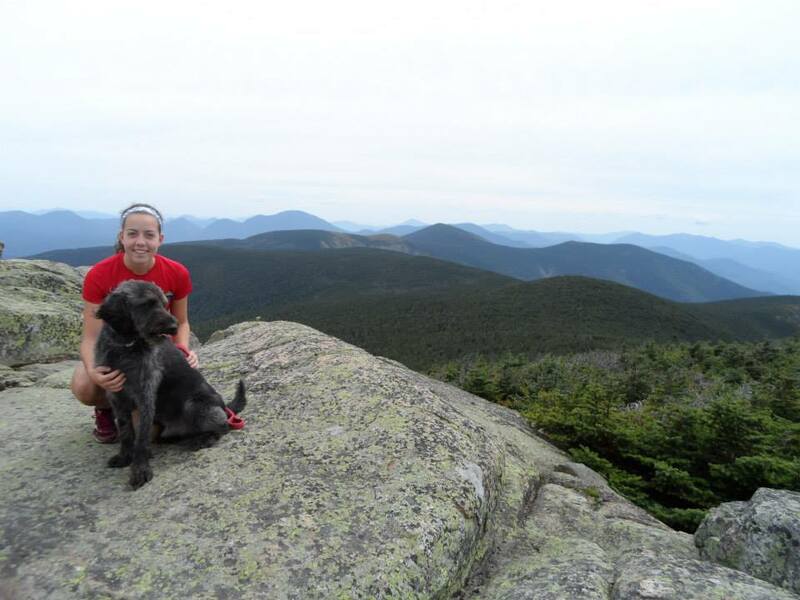 Since then I’ve brought Samson on numerous runs, we’ve gone camping with him, and he’s even hiked with me up a few mountains! Samson has been the perfect addition to our family. We’re so happy that we adopted him. 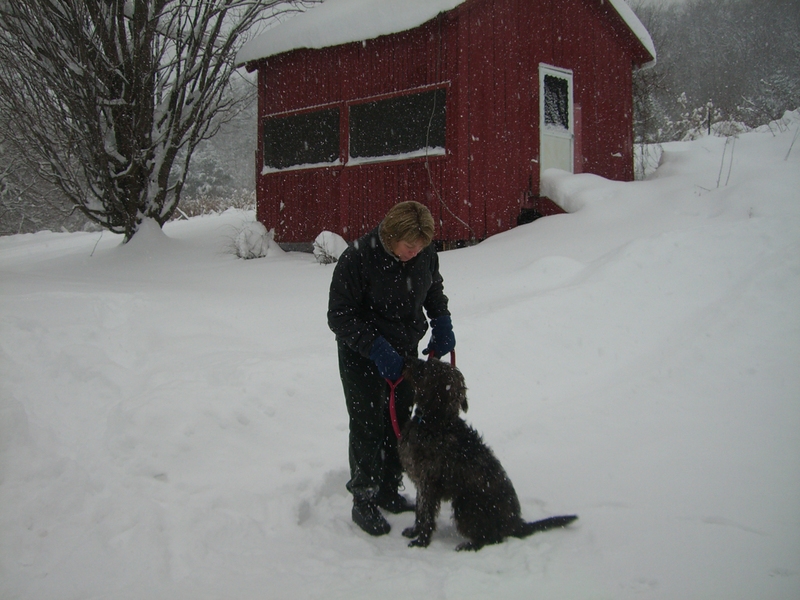 Here’s some pictures from Samson’s first winter in Vermont. awwww, look at that face! I’m also proud to say that the rest of our family also has rescue dogs. Here’s a photo from Thanksgiving this year. 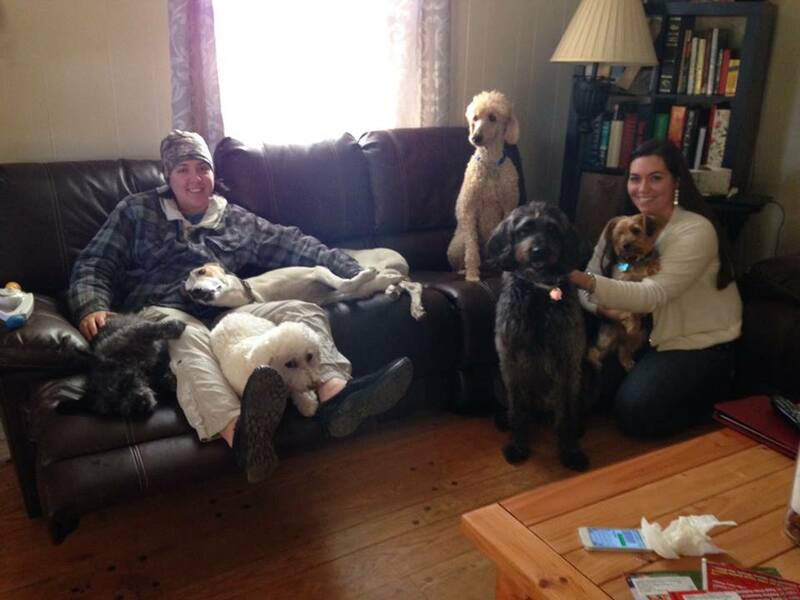 All 6 dogs are rescues! 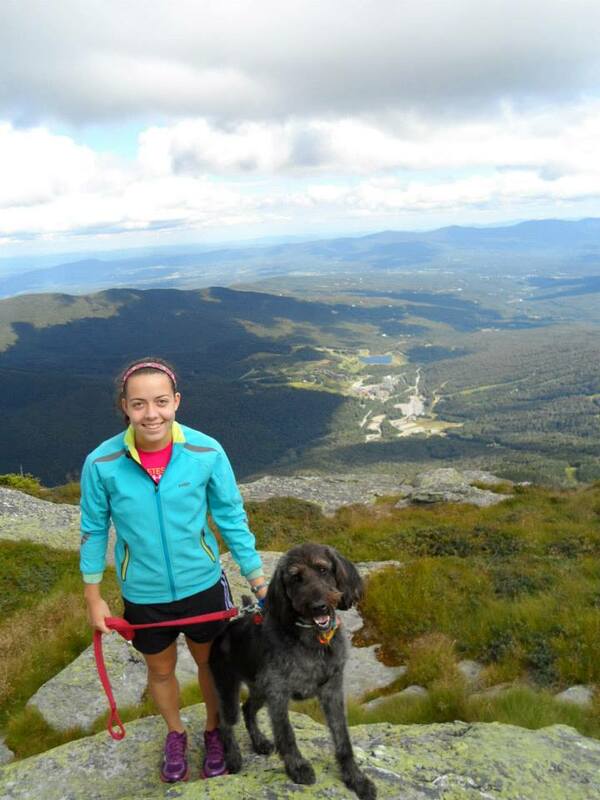 Do you ever run with your dog? 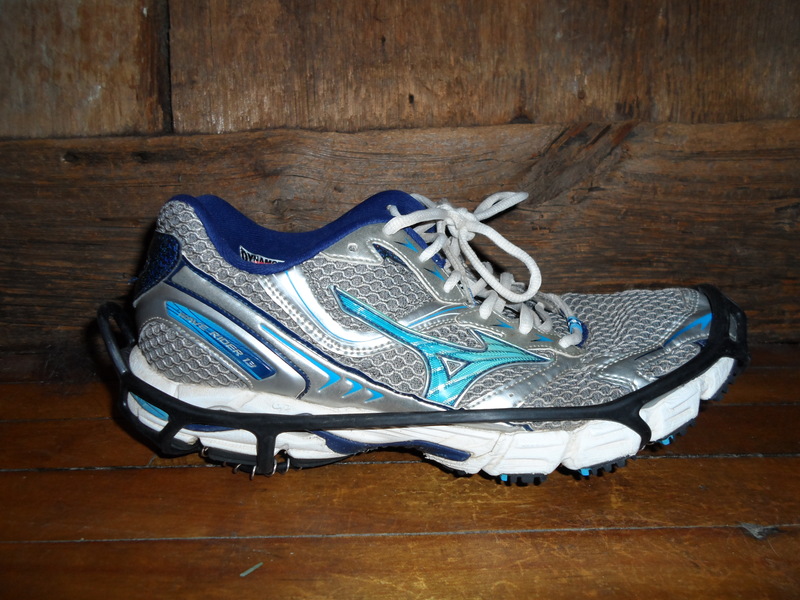 Is he/she good to run with? Have you ever experienced that feeling of euphoria? That feeling of being so incredibly happy that you couldn’t stop smiling? NO, I’M NOT TALKING ABOUT DRUGS. I’m talking about the runner’s high – the extreme joy that happens either during or after a run. me at the end of the Downtown 10k. I look like I’m floating! Last night I joined one of my friends for dinner right after finishing my run. Let’s just say that probably wasn’t a smart idea. For some reason I don’t get it on every run, though (that would be awesome if I did!). For instance, if I have a really miserable workout then I oftentimes don’t get the high (disgusting weather, couldn’t finish the workout, feeling sick, etc.) The biggest culprit in high school was probably having a bad race. That was an extreme mood killer for me. Even if I don’t get the runner’s high, though, I almost always feel better afterwards. I’ve never felt regretful after a run, but definitely have felt regretful for skipping it. What do you act like after your run? Do you ever get the runner’s high? All of these factors combine to make me less motivated to be active and I know I am not alone in this. Plenty of my running friends also complain about the difficulties of winter running. Here are a few techniques that I use to keep myself moving during the winter months. Unfortunately, we can’t control the weather, but we CAN control what we wear. 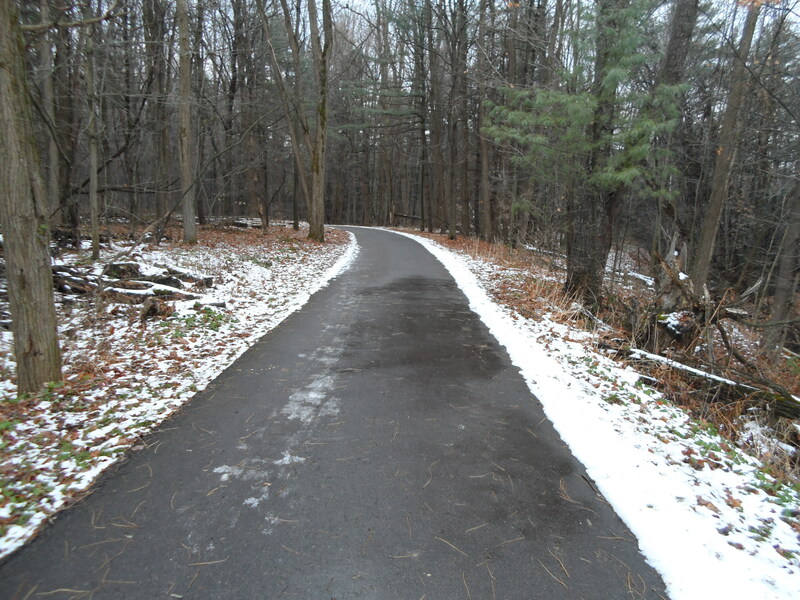 Even if it is freezing outside, it can still be a manageable temperature to run in depending on the clothes we have on. Have lots of different types of layers. My dresser is full of ¾ length tights for when it is a little warmer outside, normal spandex running tights, running tights lined with fleece for when it is extra chilly, and jackets of varying degrees of insulation. However, I would say the most important piece of clothing is a hat. 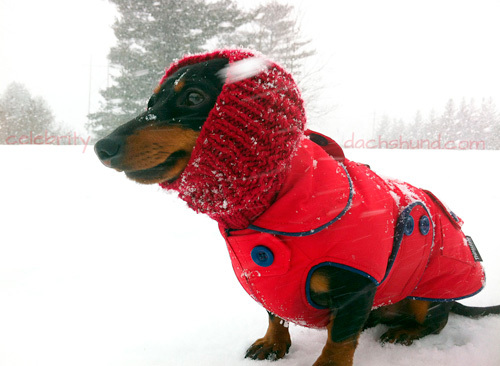 Most of our body heat escapes through our heads, so wearing a hat can majorly affect how hot or cold we are. Tip #2 – Hand Warmers! Hand warmers and toe warmers are my lifesavers when it comes to running outside. I have Raynaud’s, which basically means that my fingers and toes get really cold really easily. My hands will turn a nasty white/yellowish color and become numb to the touch. All in all, not very fun. Hand warmers and toe warmers warm up fairly quickly and can stay warm for hours. Most of the time my gloves are warm enough for me, but if they get wet or if I’m not constantly moving my hands get cold fairly quickly. 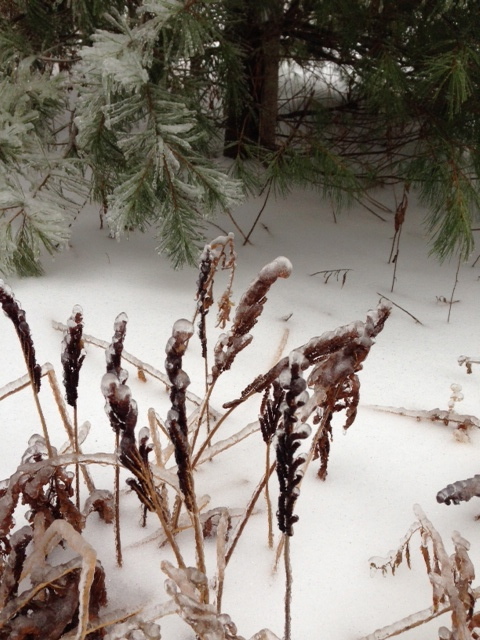 Let’s face it – when there is a foot of snow on the ground and the roads aren’t plowed, it is really hard to run. No, I’m not saying that it is impossible. I’m just saying that this poses a challenge when trying to get a workout in. 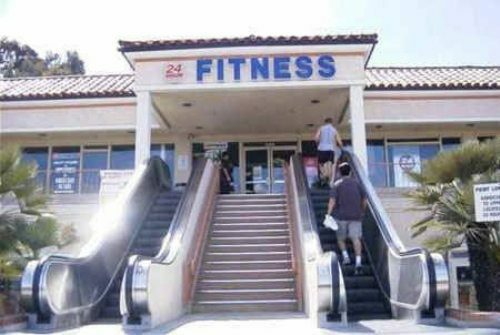 Having a membership to a gym gives us an easier way to work out. The new environment can even motivate us to do more than we would have otherwise. Almost all gyms have treadmills and some even have indoor tracks. Plus, they have other equipment and even fun classes that can help us stay in shape, which brings me to my next topic. Notice anything wrong with this photo? 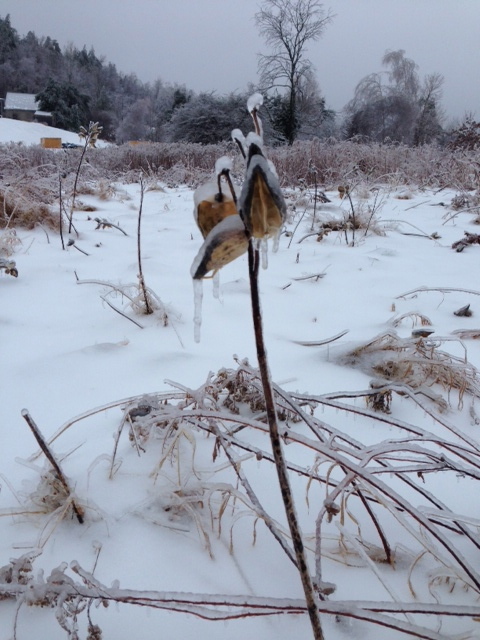 There are very few races in the winter (at least in Vermont). This means that for most of us, winter is not a high-intensity training period. Many runners are taking some time off or starting to base-build for a race in the spring. Spinning – try a class maybe? 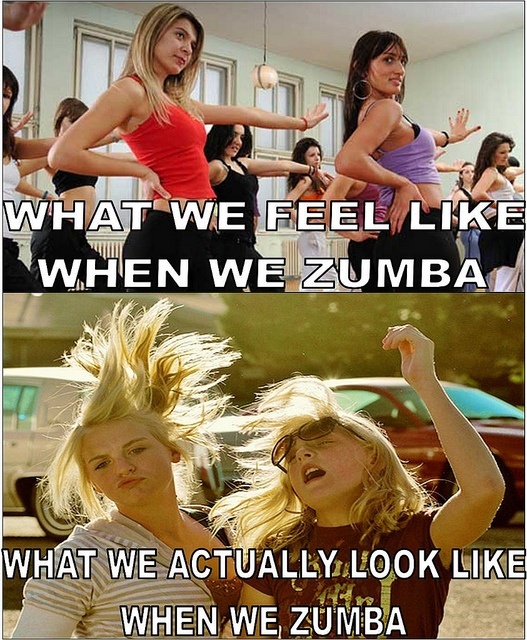 Zumba –the new dancing craze! Swimming – yay! No pounding again! Plus, works your upper body. 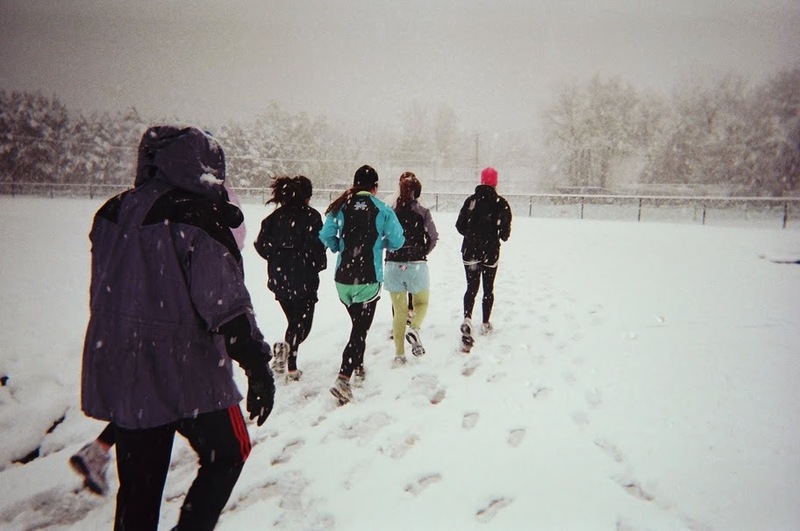 Instead of focusing on how the winter impacts your normal running routine, focus on the positives! For instance, winter brings snow, and snow brings snow activities. Once again, cross training! sledding – can surprisingly be a pretty good workout. Walking up hills is hard! No matter how big or small, goals help keep us motivated and that is a good thing. Write your goals down, post them on a wall, and keep track of your progress. Like I said earlier, there are not many races in the winter. So, many runners are focusing on training for a race in the spring. Having a race in mind helps to keep us motivated. Even better, sign up for one! This little effort gives enough incentive to help get us out the door on a cold morning. 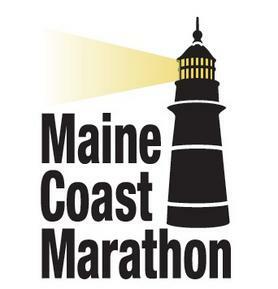 I’ve got my eyes set on the Maine Coast Marathon on May 11th. This will be my first full marathon and I am so excited! What do you think? Do you have any techniques that you use to keep yourself motivated in the winter? 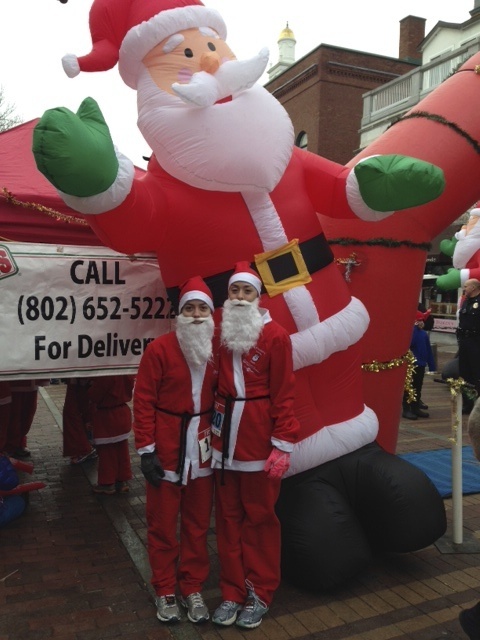 This morning my friend (Ellie) and I ran in Ri Ra’s Santa 5K in downtown Burlington, VT. Basically, everyone dresses up in Santa suits and runs a 5K that starts and ends on Church St. It’s a blast! Everyone is just there to have a good time, act silly, and get in the holiday spirit. Besides a few people at the front of the race, nobody takes it seriously. People of all shapes, sizes, and ages showed up. I even saw a mom pushing her baby in stroller – they were both dressed up in Santa suits! I ran this race last year and was surprised by the amount of people that turned up for the event. Last year, there were close to 2,000 people in the race and I’m guessing that there was probably more this year. 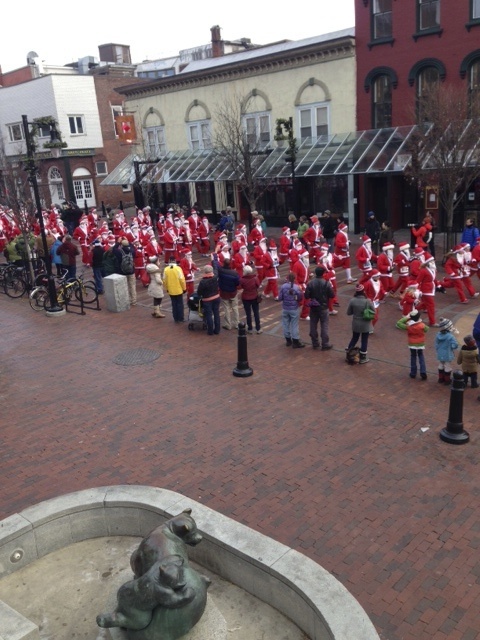 At one point going up Battery Street, I looked back at the other racers and just saw a sea of Santas. It was fantastic! I have two mindsets for races. I am either going to race my heart out and go as fast as I can, or I am just going to have a good time. You can probably guess which one this was. My friend goes to a different college than I do, so we don’t see each other as much as we would like. We’ve been running buddies since middle school and it was so much fun to run with her again. Of course, we couldn’t have done it without our great supporters. My mom, Judy, and Ellie’s mom, Tammy, were there to cheer us on! There are plenty of Santa runs all over the US. 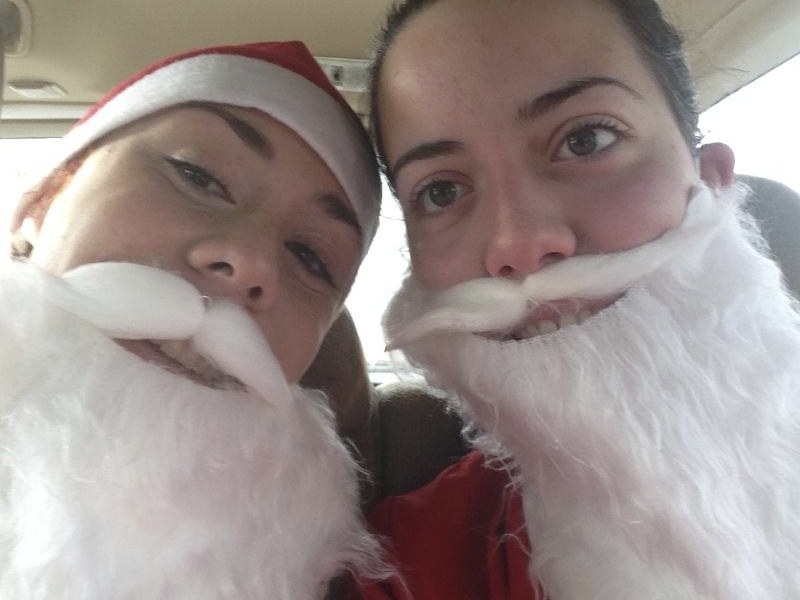 If you like to run, have a good time, and get in the holiday spirit I would definitely recommend this race to you!